The holidays are here which can only mean one thing – it’s time to deck your table with Wisconsin cheese. The new Holiday issue of Grate. Pair. Share. is full of fun and festive ways to dazzle guests and help make all of your gatherings merry, bright and full of flavor. “Whether you’re hosting a cocktail party for friends, making dinner for the family or creating a beautiful tray of cookies to share, you’ll find lots of ways to make your holidays even more delicious with award-winning Wisconsin cheese,” said Suzanne Fanning, Dairy Farmers of Wisconsin Senior Vice President and Chief Marketing Officer for Wisconsin Cheese. Keep party prep to a minimum with ideas for easy yet elegant three-ingredient appetizers like Mozzarella and Prosciutto Pinwheels, Garlic and Herb Cheese Roll-Ups, Pesto and Asiago Stuffed Mushrooms, Aged Cheddar-Cranberry Crostini, Cherry Havarti Tartlets, and Cheesy Twice-Baked Potato Bites. 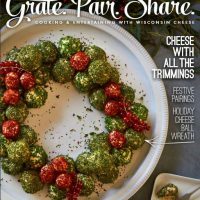 The Holiday Cheese Ball Wreath, featured on the cover, is also sure to be a stand out starter, combining fresh herbs with Crystal Farms Cream Cheese and Hook’s Two-Year Sharp Cheddar. Spread cheer throughout your holiday menu with recipes for flavored butters that pair perfectly with just about every dish. Enjoy Cranberry Chipotle Cheddar Butter with fresh baked bread for a sweet and spicy kick, or melt fresh Pear and Blue Cheese Butter for a sweet and savory steak. You can even enhance your seafood entree with a recipe for zesty Lemon and Dill Havarti Butter. Mascarpone Sugar Cookies are the perfect seasonal sweet treat. Learn how one recipe for dough can easily turn into three types of Christmas cookies. For more recipes and holiday inspiration click here to view the Holiday Issue of Grate. Pair. Share. and watch the latest videos from the Wisconsin To Table video series with simple steps for building a festive holiday cheeseboard, making a warm Honey Roasted Feta appetizer, and crafting a festive Christmas Cookie Tin by recycling a mascarpone cheese container.